FG-KFS2C Antibiotic Vials Auger Filling Machine is main equipment of sterile production line. The main principle is to use the motor to control auger delivering powder driver laps to accurately control powder and fill into antibiotics vials according to specified capacity. 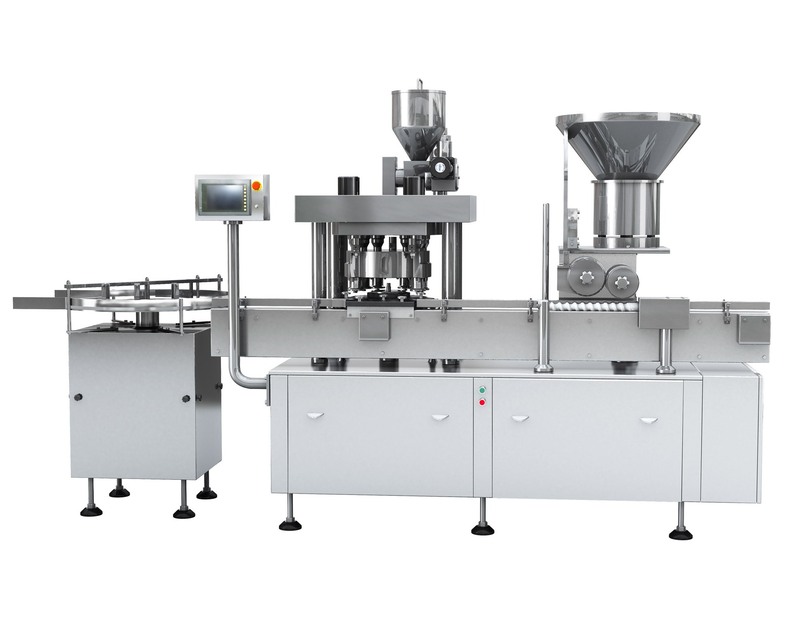 It delivers vial, Twin auger first filling, Twin auger secondary filling, double chute automatic stoppering through the double chute, to assure that the net weight of the filled powder in the antibiotic vial strictly controlled in required accuracy, secondary filling is also applicable to large dosing. The main structure is vial feeding-exiting, Twin auger filling station I, Twin auger filling station II, stopper oscillation tray and stopper pressing structure, indexing tray delivery structure, delivery inside the tank and control system. b) Twin auger filling head one: constructed by motor, auger, powder measure, powder cup, mixer, prevent metal scrap automatic controller etc. Motor controlled by microcomputer, and accurately control auger driven filling quantity size. At the same time, it is equipped with a spiral feed hopper, use motor Stepless speed control for powder, so as to ensure that a powder remain unchanged. Additionally, it is also supported by electronic automatic monitoring function, it can automatically stop and show fault for metal scraps and other blockage. c) Twin auger filling head two: constructed by motor, auger, powder measure, powder cup, mixer, prevent metal scrap automatic controller etc. Motor controlled by microcomputer, and accurately control auger driven filling quantity size. At the same time, it is equipped with a spiral feed hopper, use motor Stepless speed control for powder, so as to ensure that a powder remain unchanged. Additionally, it is also supported by electronic automatic monitoring function, it can automatically stop and show fault for metal scraps and other blockage. d) Rubber stopper oscillation tray and stoppering mechanism: transport hopper inner rubber relying on oscillation frequency, and release stopper at the end of orbit, intermittent absorb and release stopper by pressing stopper vacuum hand. Pressing stopper vacuum hand adopts the machinery reciprocating rotary for pressing stopper. e) Indexing tray delivery mechanism: adopts machinery mechanism or Kukaishen for intermittent dividing, vial feeding and vial exiting, filling, stopper feeding and stopper pressing, vial exiting could meet each station control requirements under the control of graduator. f) The transmission mechanism inside the tank: powered by motor, gear pair, speed reducer, intermittent dividing mechanism, CAM vice and chain drive. g) Control system: use frequency conversion motor for frequency control. And the adjustment of the filling is controlled by microcomputer, filling quantity can be adjusted without machine stop. Vial go in-out mechanism: the inlet vial turntable, vial dividing star wheel, tooth shape chain and vials conveyor, it is for the antibiotic vials buffer arrangement and distribute to vial dividing shunt star wheel, vial dividing star wheel deliver the vial to the tooth shape chain, and position the vial and buckle the stoppering, and go to the next procedure on conveyor belt. Twin auger filling head I and II: constructed by motor, auger, powder measure, powder cup, mixer, prevent metal scrap automatic controller etc. Motor controlled by microcomputer, and accurately control auger driven filling quantity size. At the same time, it is equipped with a spiral feed hopper, use motor stepless speed control for powder, so as to ensure the powder location remain unchanged. Additionally, it is also supported by electronic automatic monitoring function, it can automatically stop and show fault for metal scraps and other blockage. Rubber stopper oscillation tray and stoppering mechanism: transport hopper inner rubber relying on oscillation frequency, and release stopper at the end of orbit, intermittent absord and release stopper by pressing stopper vacuum hand .Pressing stopper vacuum hand adopts the machinery Reciprocating rotary for pressing stopper functions. Indexing tray delivery mechanism: adopts machinery Ma mechanism or Kukaishen for intermittent dividing, so in and out of the vial, filling, stoppering feeding and tamponage and outlet vial meets their location control requirements under the control of graduator. The transmission mechanism inside the tank: powered by motor, gear pair, speed reducer, intermittent dividing mechanism, CAM vice and chain drive. Control system: use frequency conversion motor for frequency control. And the adjustment of the filling is controlled by microcomputer, filling quantity can be adjusted without machine stop.